Widespread adoption by dairy farmers of injecting manure into the soil instead of spreading it on the surface could be crucial to restoring Chesapeake Bay water quality, according to researchers who compared phosphorus runoff from fields treated by both methods. However, they predict it will be difficult to persuade farmers to change practices. In a four-year study, overland and subsurface flows from 12 hydrologically isolated research plots at Penn State's Russell E. Larson Agricultural Research Center were measured and sampled for all phosphorus constituents and total solids during and after precipitation events. During that period, from January 2013 to May 2017, the plots were planted with summer crops of corn and winter cover crops of cereal rye. Half the plots received broadcast manure applications, while the others had manure injected into the soil. Researchers evaluated loads of total phosphorus, dissolved phosphorus, particulate phosphorus and total solids against flow volumes to learn how phosphorus and sediment losses differed between plots. Shallow-disk injection of manure was found to be more effective than broadcasting manure in promoting dilution of dissolved phosphorus and to a lesser extent, total phosphorus. The broadcast manure plots experienced more runoff of particulate phosphorus than did the injection plots. 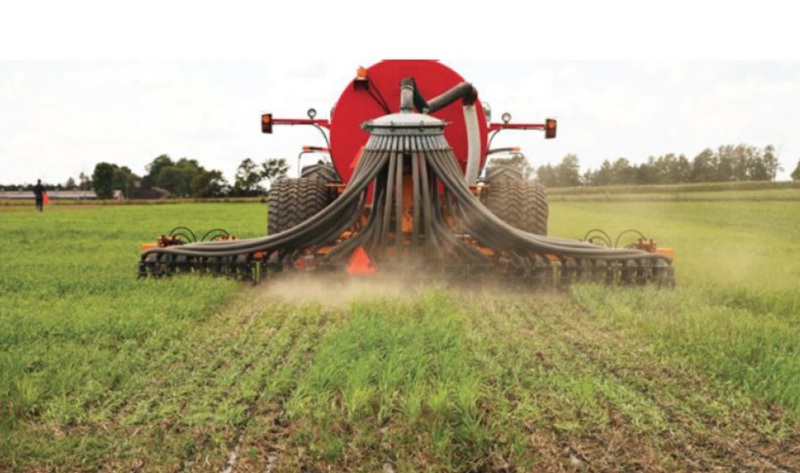 Importantly for no-till advocates, no difference was detected between application methods for total solids in the runoff — meaning manure injection, with its slight disturbance of the soil surface, did not cause sedimentation. No-till practitioners, who constitute slightly more than half of the dairy farmers in Pennsylvania, have been slow to adopt manure injection due to concerns about the practice causing sedimentation and muddying streams. However, the precision and accuracy of the study, recently published in Agriculture, Ecosystems and Environment, was constrained by hydrologic variability, conceded Jack Watson, professor of soil science and soil physics, Penn State. His research group in the College of Agricultural Sciences conducted the study. Watson pointed out that the findings demonstrate that, even at a small scale, the effectiveness of a practice in accomplishing water quality benefits varies. "This has been the case with previous phosphorus-mitigation field studies, as well," he said. "Even studies done with carefully constructed research plots like ours, which allow us to collect, measure, test and contrast runoff, are confounded by hydrologic variability." But despite the variability, the findings showed that manure injection decreased the overall phosphorus losses, according to lead researcher Melissa Miller, a master's degree student in soil science when she conducted the study. "When we looked at the total phosphorus losses from the plots, we were able to see a strong trend," she said. "It was revealed in both overland and subsurface flows following rain events." That variability, however, complicates efforts to convince dairy farmers they should convert to manure injection, noted research team member Heather Gall, assistant professor of agricultural and biological engineering. She suggested that the practice, widely adopted, could help states comply with total maximum daily load stream regulations set by the U.S. Environmental Protection Agency to protect the Chesapeake Bay from nutrient pollution and associated algal blooms and dead zones. "When we make recommendations to farmers about what they can do to improve runoff quality, we want to be able to tell them how well it will work," she said. "But how much manure injection will reduce the amount of phosphorus loss on a particular farm can depend on site characteristics, such as what kind of soil it has, what kind of crops are growing and the slope of the landscape. And so, we might not be able to tell a farmer definitively what to expect in terms of load-reduction benefits, making it difficult to make a compelling case that an investment in shallow-disc manure injection equipment will be worthwhile." Watson explained that manure injection equipment is expensive and that it takes longer and requires more fuel for farmers to apply manure to their fields using injection than broadcasting or spreading it. For shallow-disc manure injection to be broadly implemented in the Chesapeake Bay drainage, he said, it will require substantial financial support from government or other off-farm sources. But it needs to be done, Watson believes. "In the Mid-Atlantic and Northeast regions, we have a lot of dairy animals concentrated in a small area. We have all this manure that has to be gotten rid of and all the nutrients that go with it have to be disposed of on a small amount of land. It must be done in a way that will protect the Chesapeake Bay," he said. And even if the phosphorus reductions are uncertain due to site variability, Watson added, there are the additional benefits from manure injection, such as reducing ammonia volatilization and reducing odor emissions, which have significant value as well. Also involved in the research were Charlie White, assistant professor of soil fertility and nutrient management and Kathryn Brasier, professor of rural sociology, Penn State; Peter Kleinman, Anthony Buda, Lou Saporito and Tamie Veith, Pasture Systems and Watershed Management Unit, U.S. Department of Agriculture, Agricultural Research Service, University Park; and Clinton Williams, Arid-Land Agricultural Research Center, U.S. Department of Agriculture, Agricultural Research Service, Maricopa, Arizona. The U.S. Department of Agriculture supported this work.